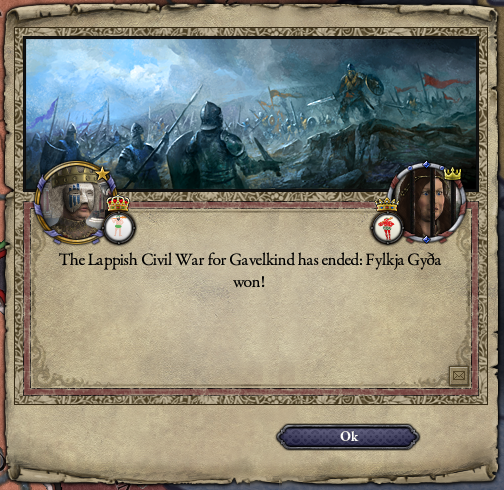 Finally free of gavelkind! Now we’re getting somewhere. King Ingjald the Bewitched can relax a little, but not too much. 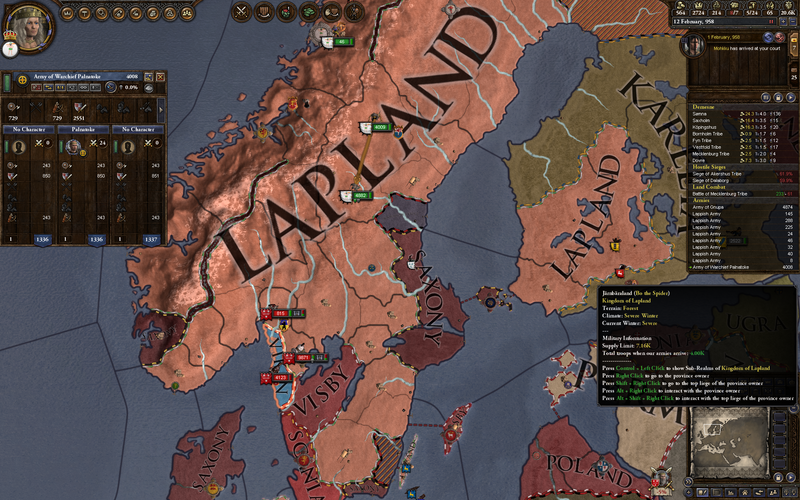 The relatively united Lapland forged by Ottarr has been nibbled away at, and with only three counties in my personal demense my military power is pretty weak. Meanwhile, the earlier mess of German states is solidifying into a powerful Saxony and Poland, and an even more powerful France. 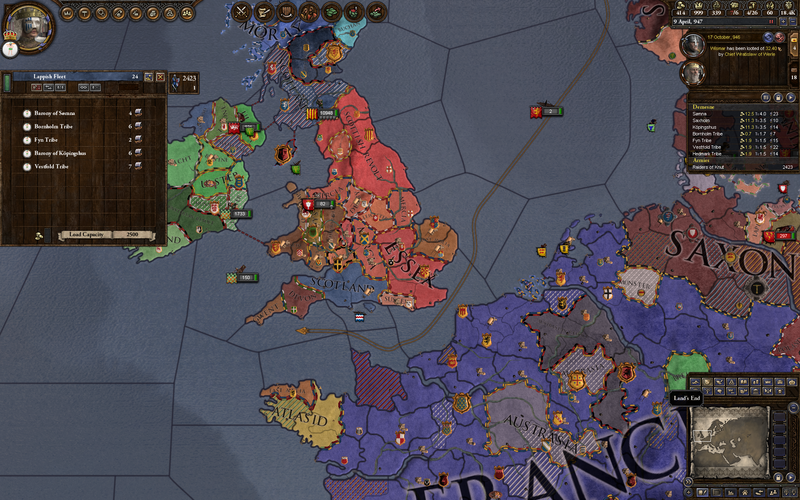 England is still a disaster of tiny realms, though. 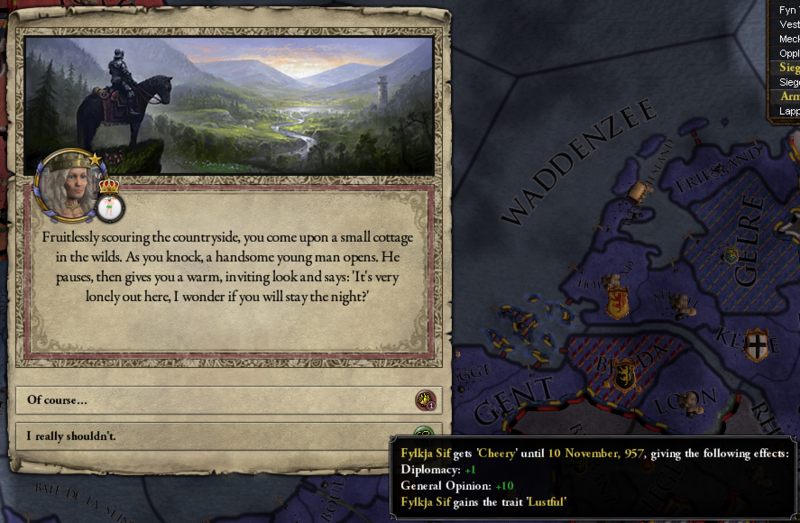 The Queen of Saxony is too strong for me to take on, so clearing her out is going to have to wait. 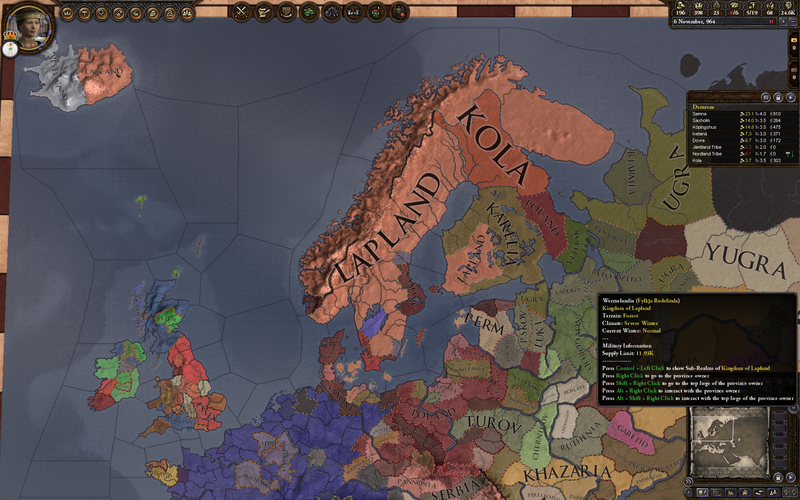 On my eastern border is Karelia, which looks weak, but Rögnfrið tried to take them on and we all remember how badly that went. They have a lot of allies. So, Ingjald is somewhat stymied for the present. Turns out not to matter though! 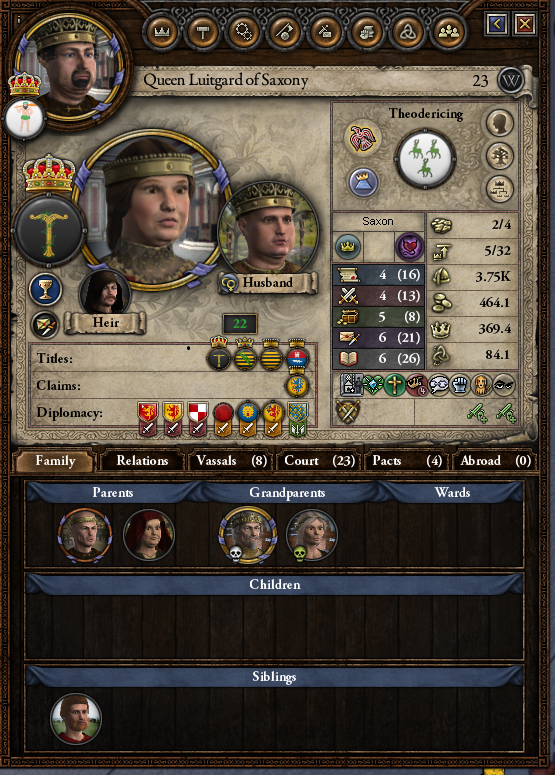 His eldest son, no doubt pissed about the succession law change, sneaks a viper into his bed. I’m impressed that Ingjald can recognize Ake’s snake on sight, though. So Ingjald dies, not long after securing his greatest accomplishment. 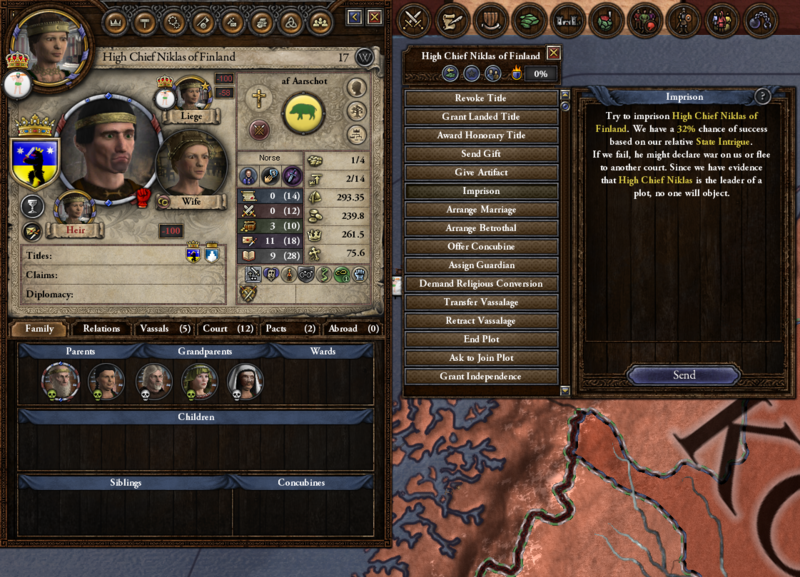 One of the annoying things about seniority succession, for storytelling purposes, is that it means the titles hop all over the dynasty and make the relationships tricky to describe. But I’ll try. Genealogy time! Ormr, who founded the dynasty, had seven children: Gurli, Þordis, Astrid, Gnupa, Ingrid, Guðfrið, and Rögnfrið. His successor was Gurli’s daughter Gloð. Ottarr was the son of Gloð’s sister, Bothhildr, and Rögnfrið (another one) was his daughter, and Ingjald was her son. 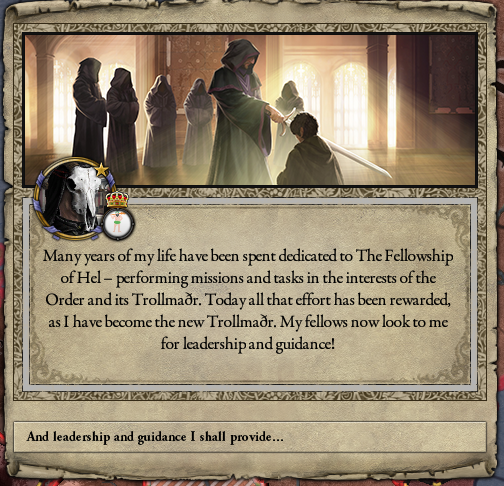 So to this point all the rulers have been within Gurli’s line, and pretty much direct descendants except that Ottarr was Gloð’s nephew. 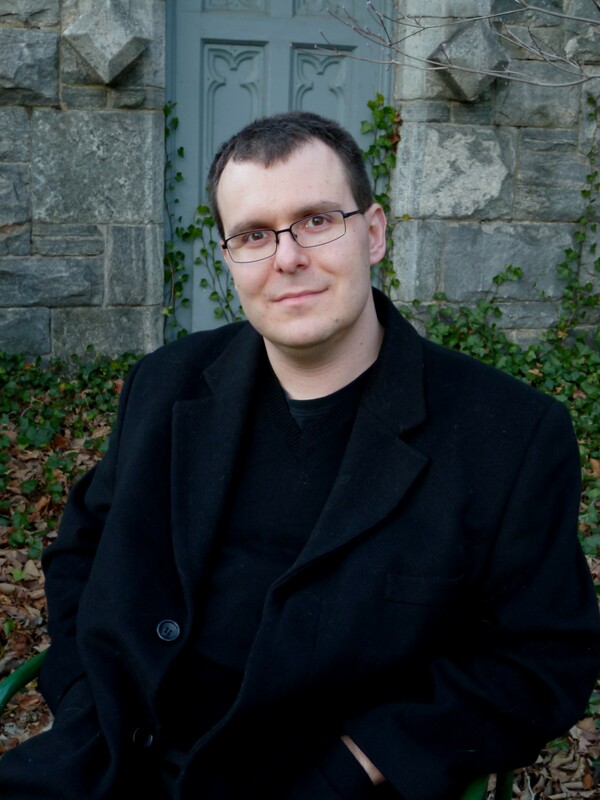 The new king, Guðröðr, is in the same branch of the family — he’s Gloð’s grandson, via her youngest son Hrolfr. But after this point things can get crazy. 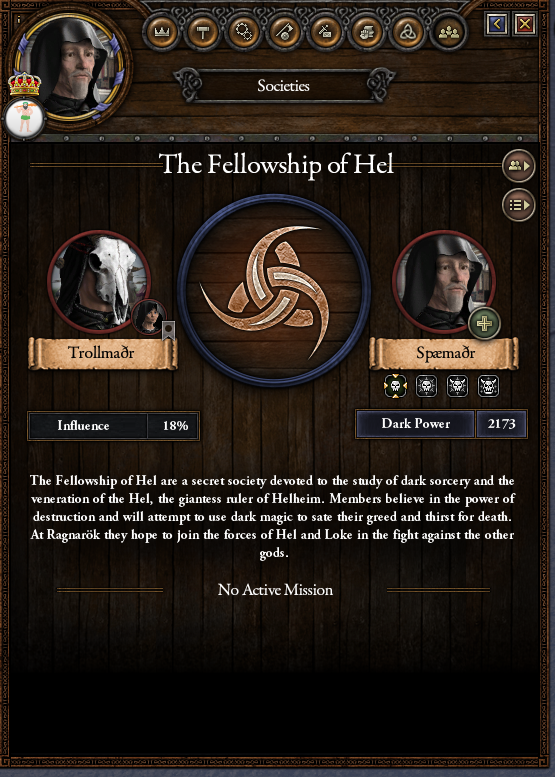 Guðröðr, it turns out, is already in the society of Hel! 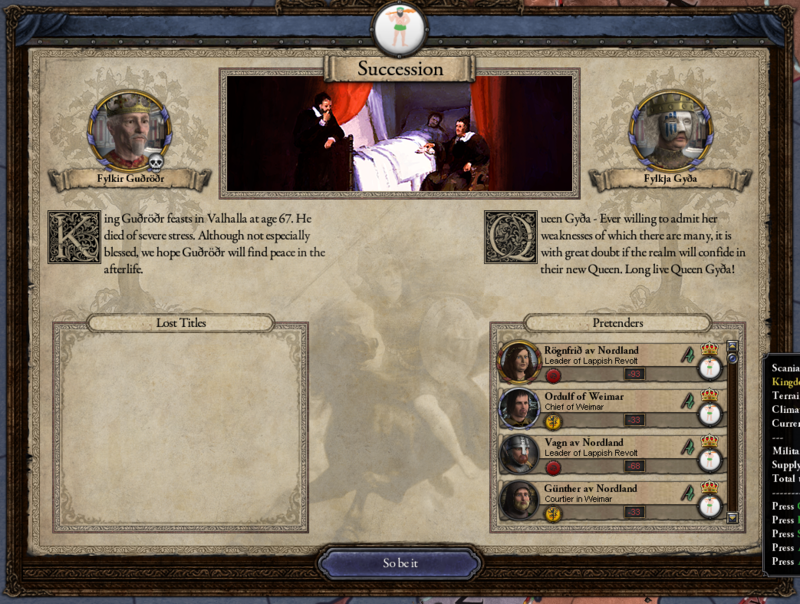 But I no longer need to sacrifice my children to ensure succession, thankfully. 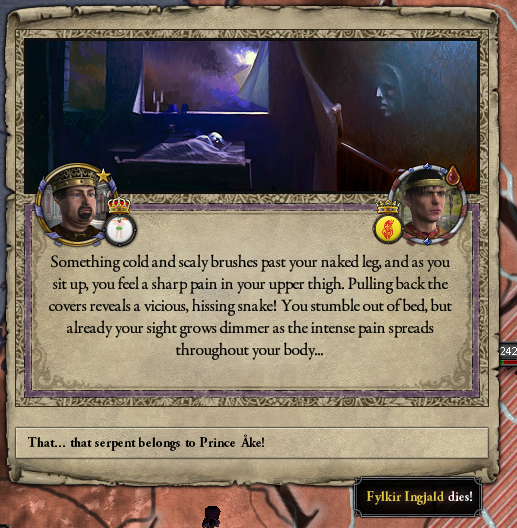 Maybe I’ll give the dark powers a miss from now on. First order of business: revenge. However, there’s more to it than that. 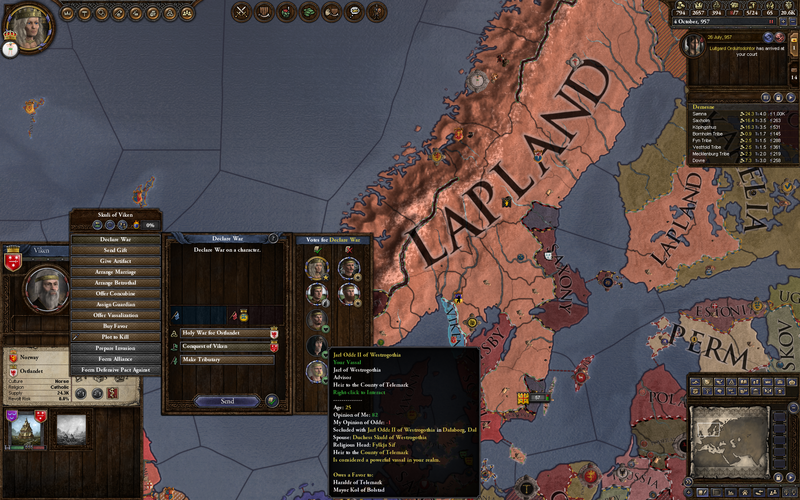 Åke is a substantial landholder, and as the eldest dynasty member I’m now his heir. 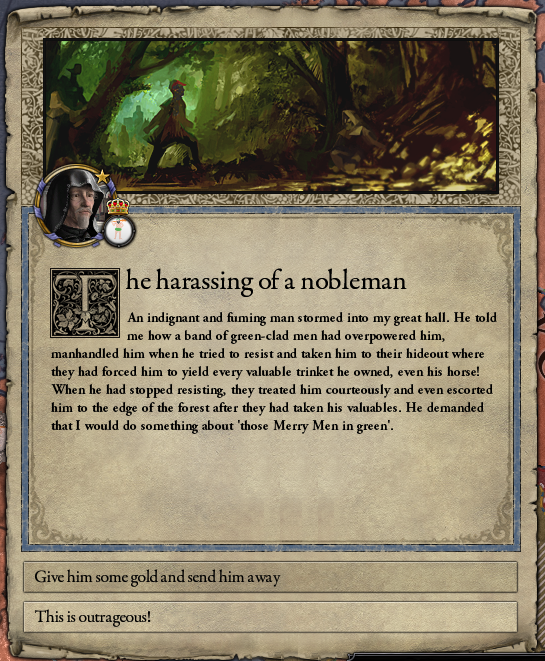 Killing him will bring me his territory and substantially beef up my depleted demense. This works out perfectly. 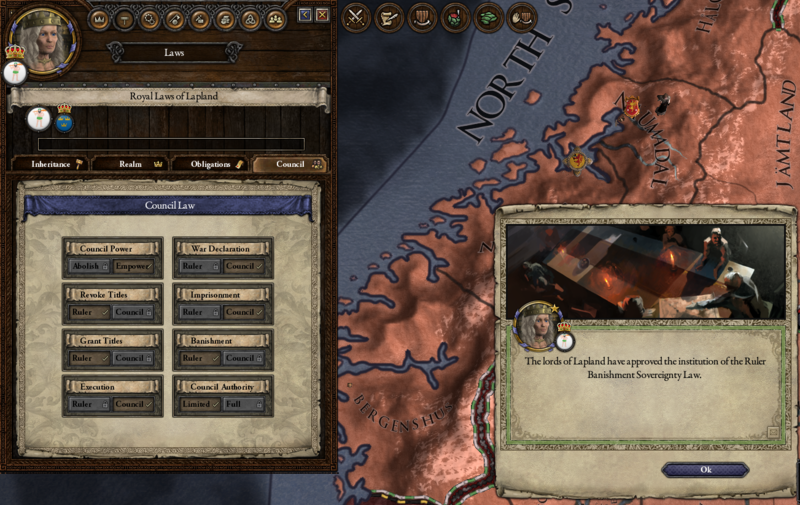 I go from three holdings to nine, and poor Ingjald is avenged. 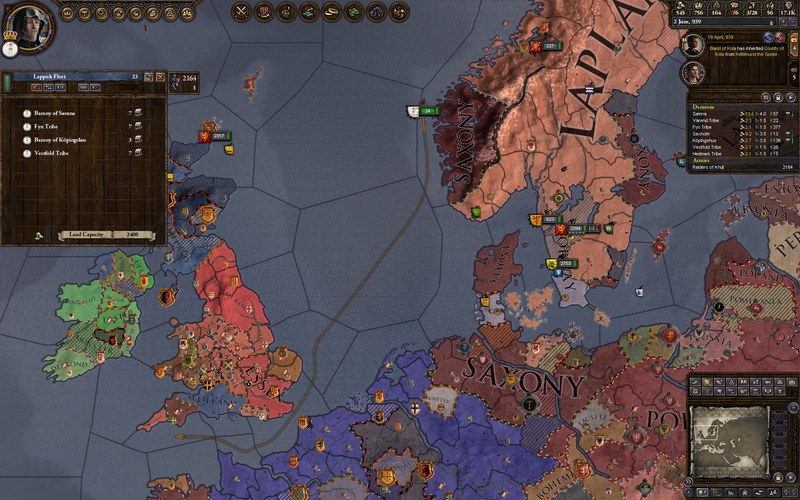 Guðröðr then hunkers down, because the vassals are restless. 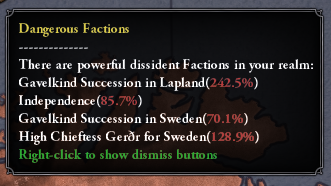 They’re not happy with this new succession regime. The Sheriff of Nöttinghåm is apparently having some trouble. Scandalous! Something must be done. Everyone knows outlaws can never resist an archery contest. Isn’t this Lapland? If they’re hiding in the forest, can’t we just wait for winter and assume they’ll freeze to death? While all this delightful plotting is going on, Guðröðr sends his warriors to continue the serious work of setting Cornwall and Brittany on fire. 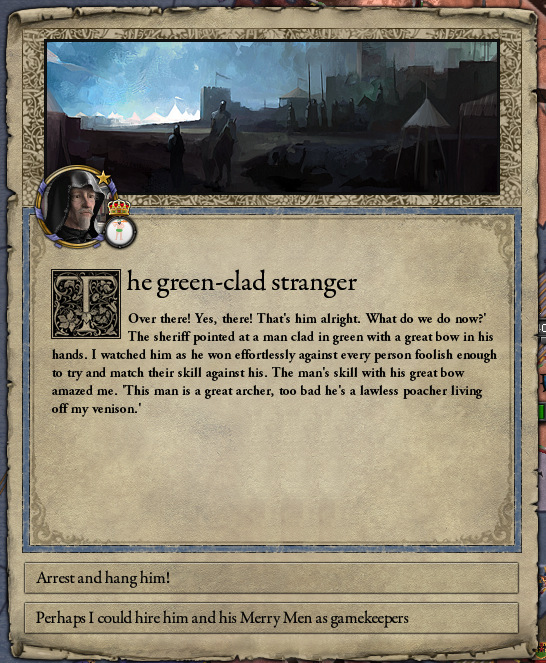 A great archer, you say? Sounds like a useful guy to have around. Damn. Forget gamekeeper, I’m making Robin a general! Although he doesn’t look much like Cary Elwes. 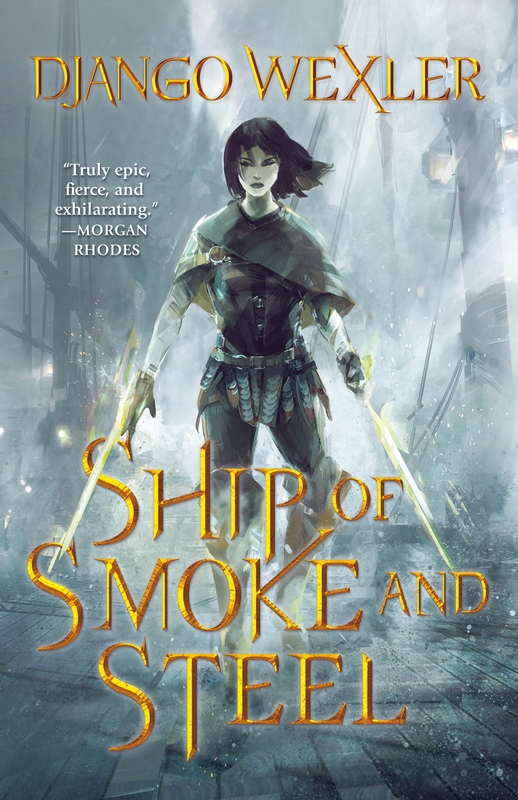 Marion is no slouch herself, if it comes to that. 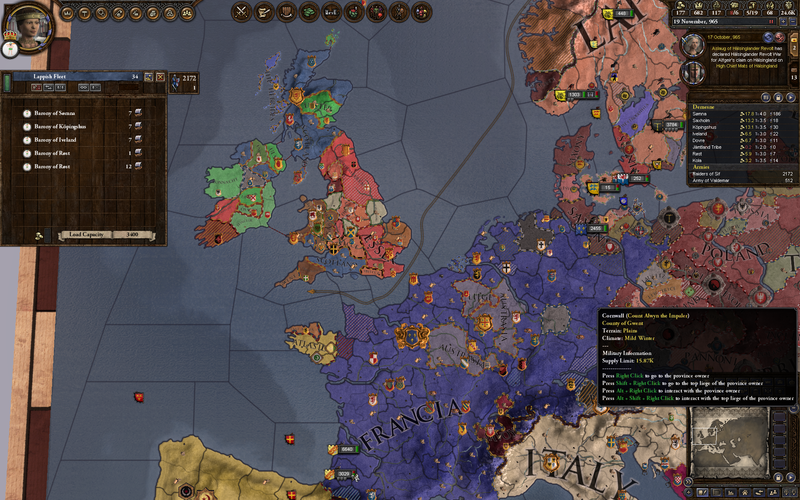 The long-feared revolt finally breaks out, with a Catholic uprising to boot. Fortunately, my men are on their way back from raiding, and cheerfully jump in to beating on the rebels. Bwahaha! Long years of biding my time have paid off! Now I will use dark sorcery to crush my enemies! Or not. 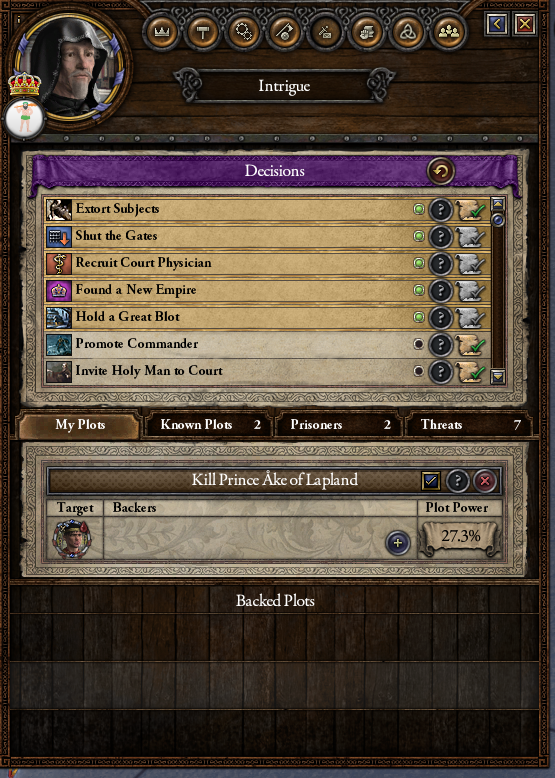 I didn’t really want to crush those enemies anyway. Gyða is still more or less in the same branch of the family. 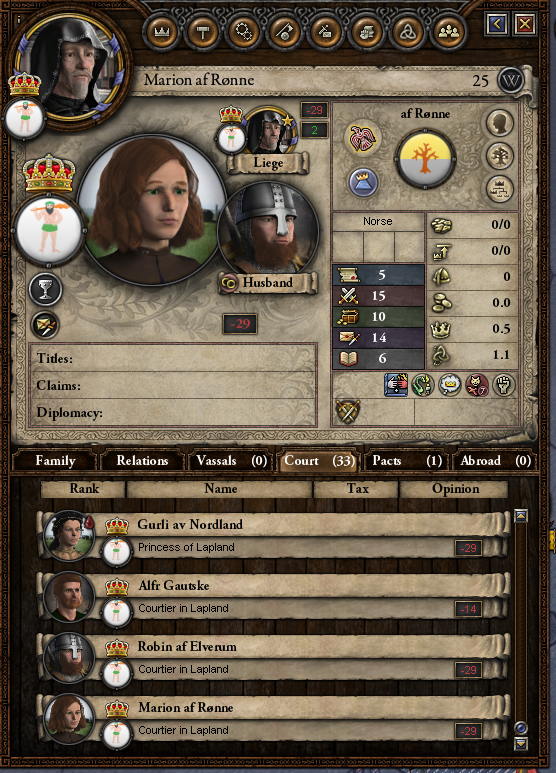 She’s also a descendant of Gurli and Gloð, a great-granddaughter of the latter via Ragnarr and Ingjald (not the king, a different one). 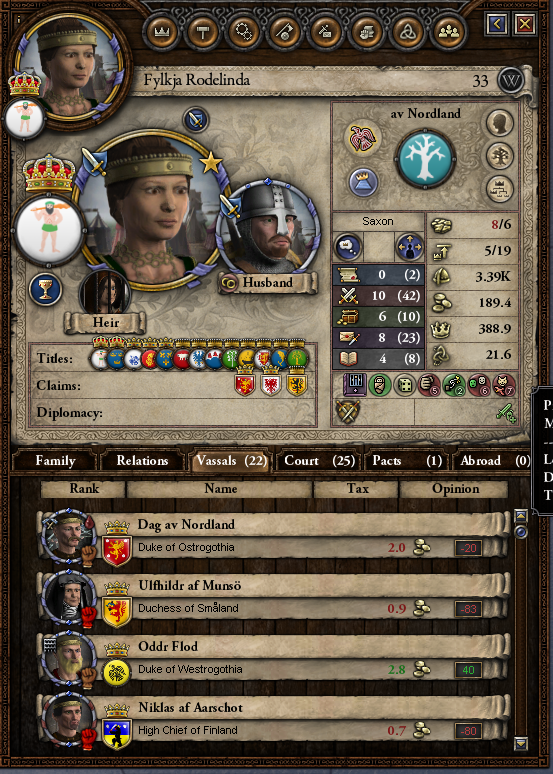 She’s disfigured and wears a creepy mask, and her stats aren’t great. But you work with what you’ve got. We’ve got a revolution to fight! 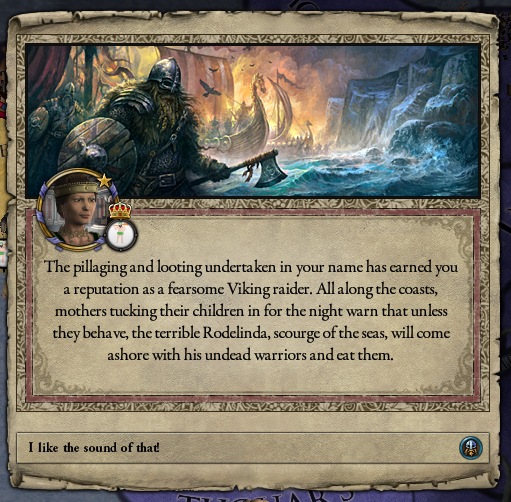 The rebels are too strong to simply crush, but my usual tactic of dancing around them with sea movement manages to outfox them. Yeah, I think we all saw that one coming. 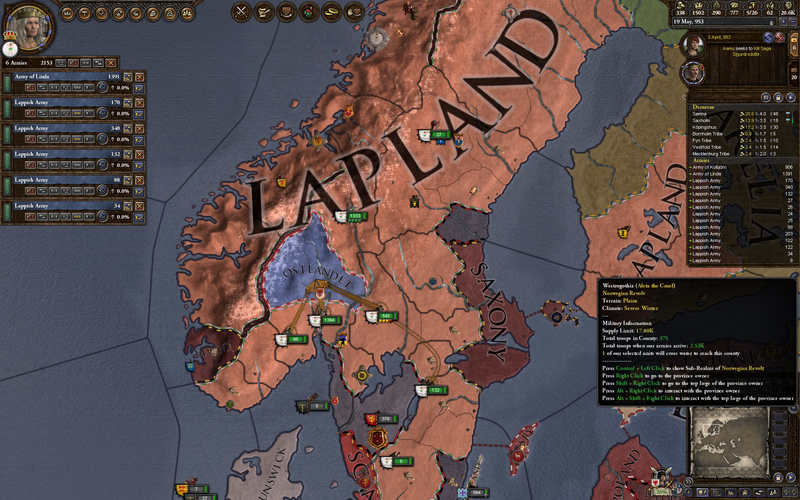 I’m slowly getting Lapland reorganized, keeping the best counties for my demense and farming out the rest to more loyal vassals. 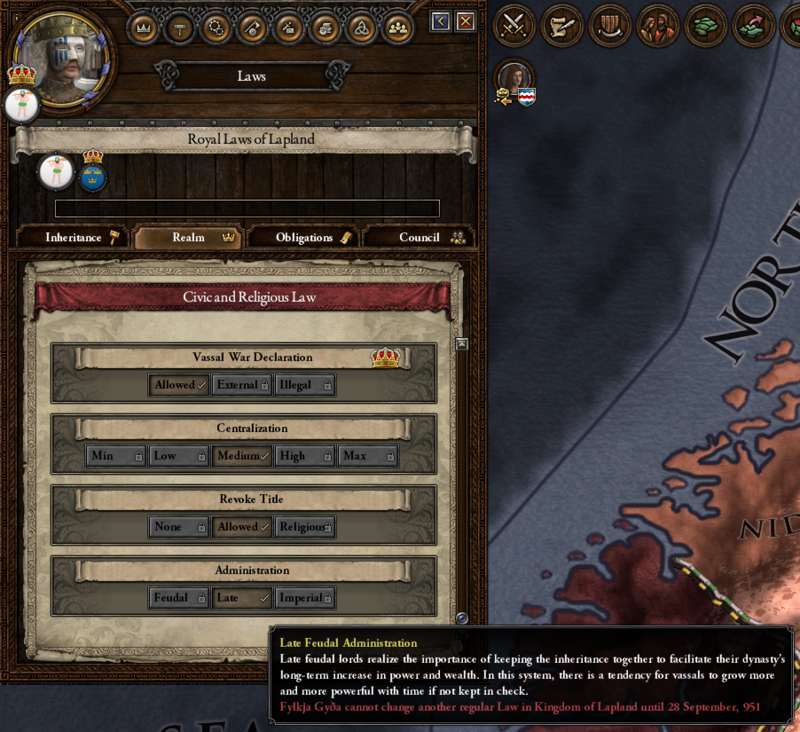 With the boost in popularity from crushing the rebellion, Gyða manages to push through Late Feudal Administration, which will — in the event that one of my rulers lives long enough and is popular enough — let me change to a better succession method. 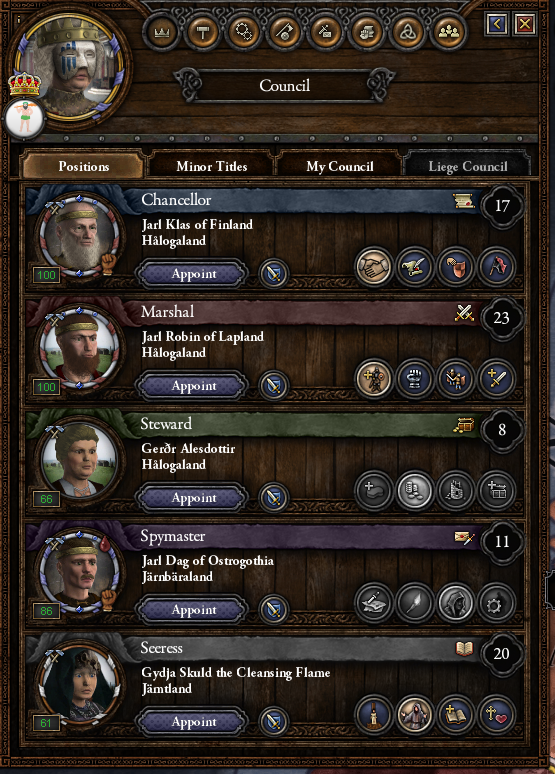 I’ve managed to stock my council mostly with sycophants, which helps get these things done. Still too weak to attack my neighbors. 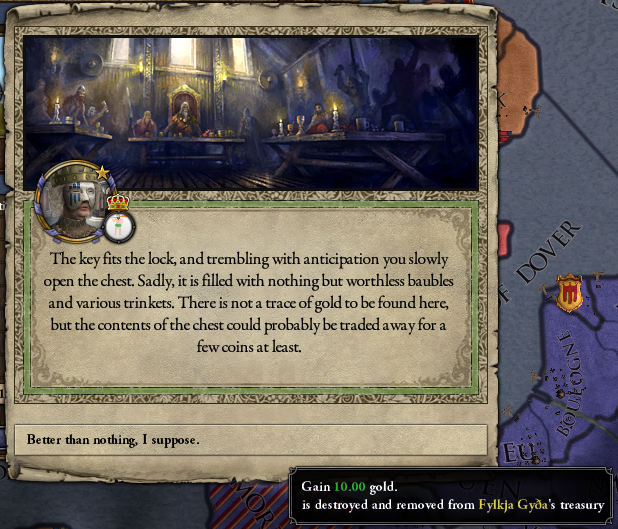 But I invest in expanded castles to generate more troops, and head out viking to get more gold. But since all his castles are occupied by one of his other enemies, he loses the war immediately. Good work, sir! Seniority succession is thinning out the ranks of the elderly in the dynasty. 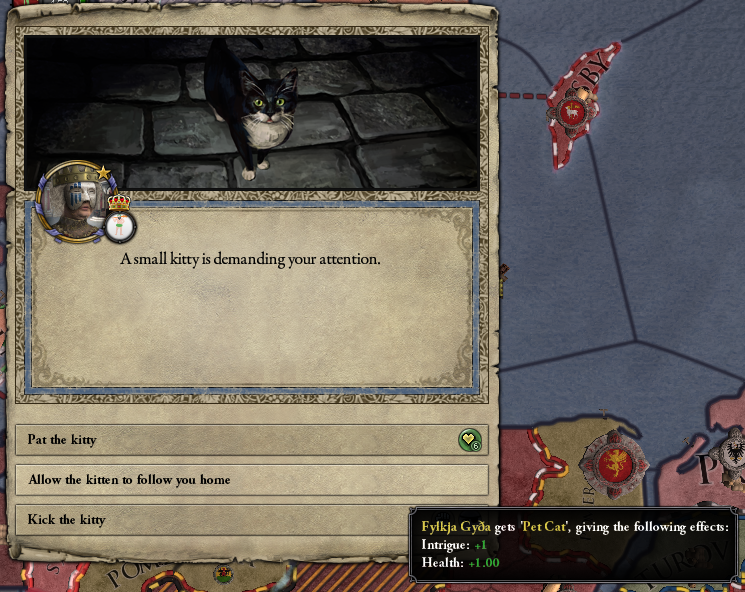 Gyða joins the ranks of the cat-owning elite. Whoa! 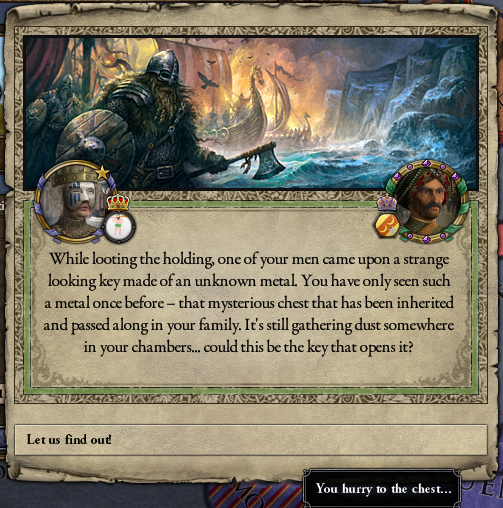 That thing has been kicking around like two hundred years. Aw, man. Talk about an anti-climax. 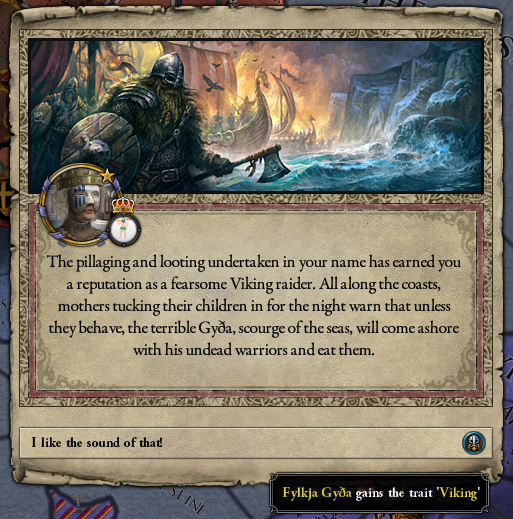 Gyða dies, possibly of disappointment. Lots of short reigns is the issue with seniority succession. Sif comes from an entirely different branch of the family tree. 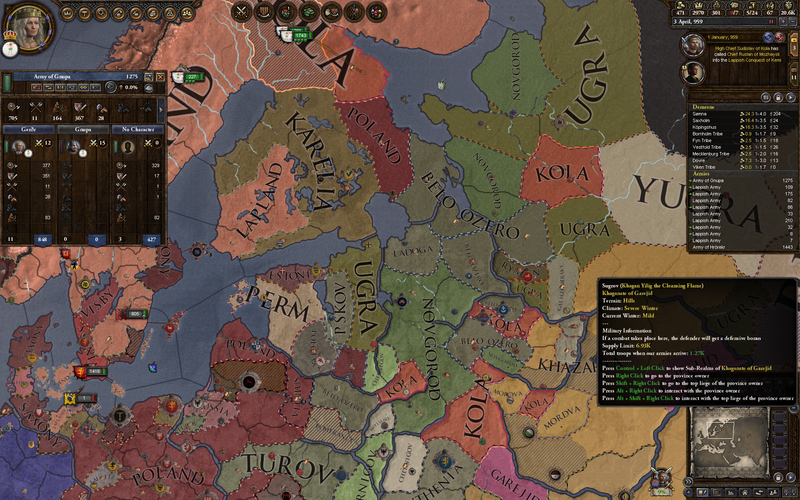 She’s descended from Gnupa, via Asa, Knut (the guy who everyone wanted me to help kill a while back), Ale, and Alfr. She’s only 49, which gives me some hope she’ll last a while, but she already has chest pains, which doesn’t. She’s also somehow both Shrewd and Slow-Witted, with ‘meh’ stats. My work on stripping the council of its powers is slowly paying off. 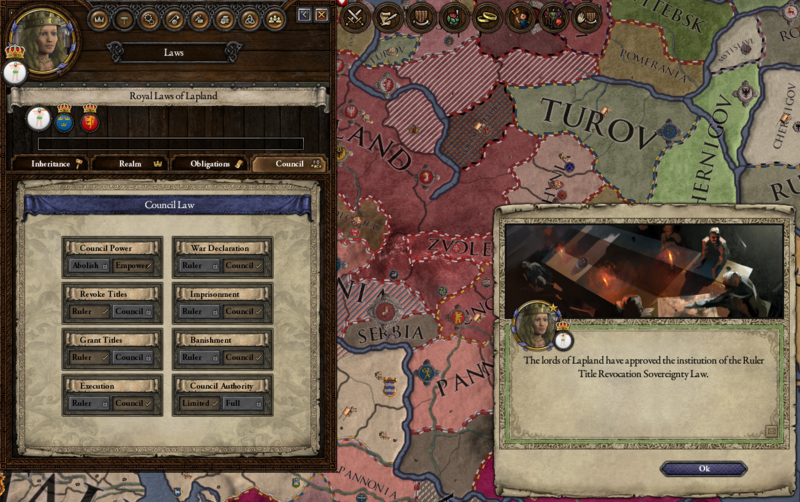 I’ve got two crucial ones, now — the ability to grant titles, which the councilors always opposed if it wasn’t to themselves or their allies, and the ability to revoke titles, which I need for stripping rebels of their land. 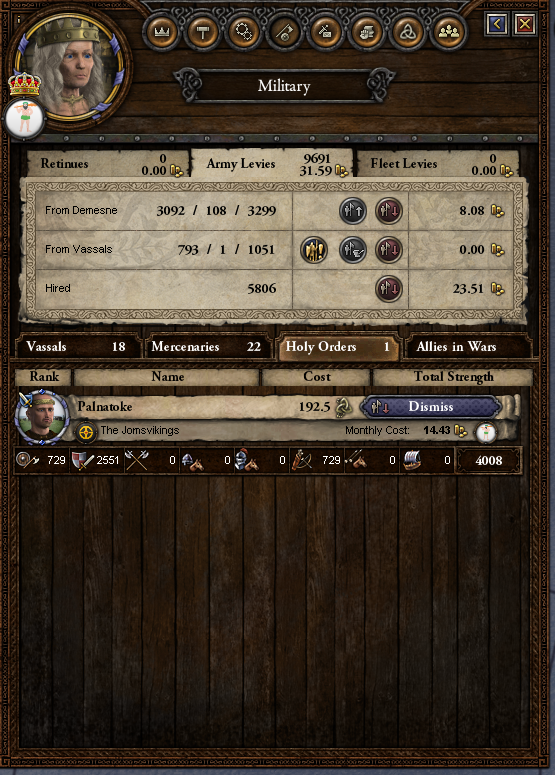 I’d like to have war declaration, obviously, but that’s the hardest one to get. This happens to Sif constantly. There’s only one explanation: Gideon ninjas. 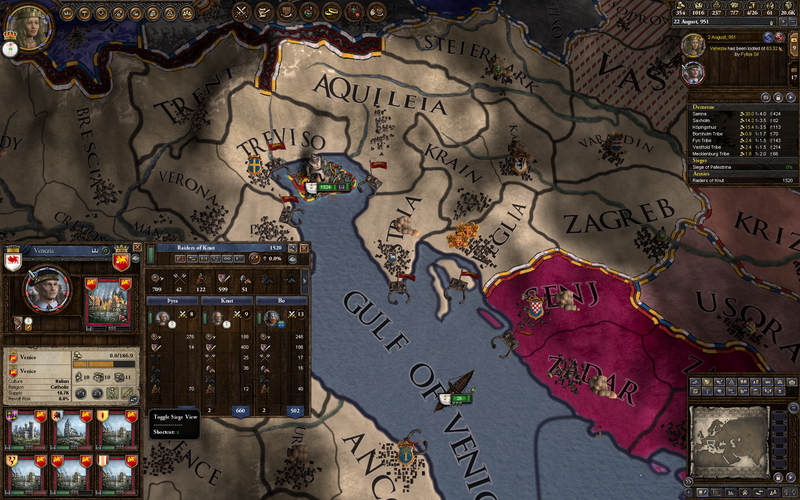 It’s been a while since I burned Venice down, but it’s just as flammable as I remember. Sif catches one of her vassals plotting and brings down the hammer. 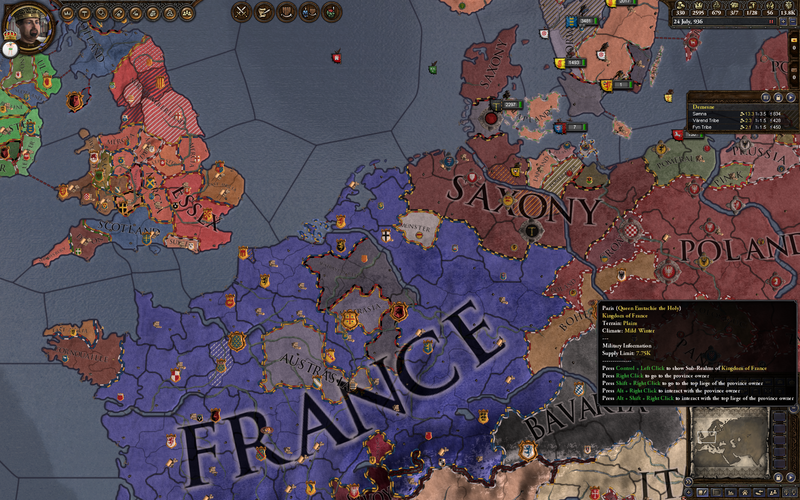 Meanwhile, some of my vassals have taken it on their own initiative to take back some Saxon land. 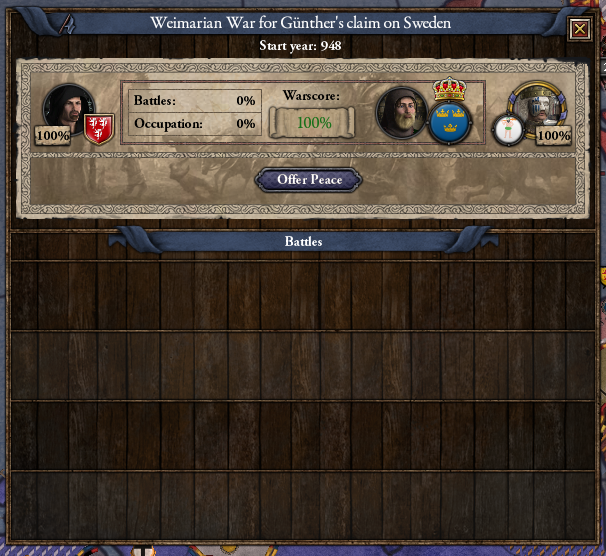 Good vassals! Residual instincts from my Israel game make me jump when one of these pops up. 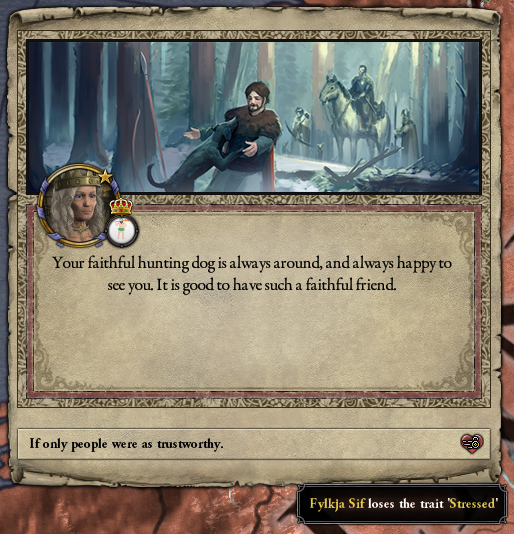 Sif continues the family tradition of general lewdness. Somewhat against my expectations, Sif is getting healthier! I guess those were psychosomatic. Getting there. Banishment is nice to have because you can strip money from captured adventurers, who always have at least 500 gold! Very nice. Finally, we’re ready to take on some small opponents again! 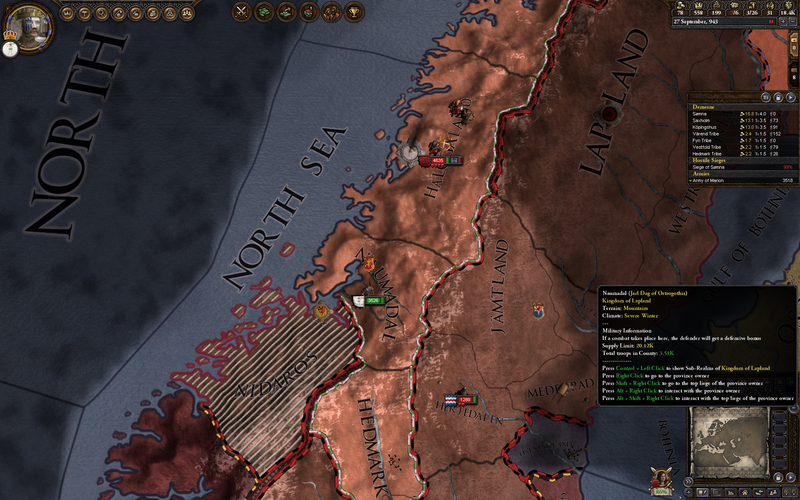 Viken is one county, so that shouldn’t be too hard. Ooooor they could hire a holy order and put five thousand heavy cavalry into the field. Well then. 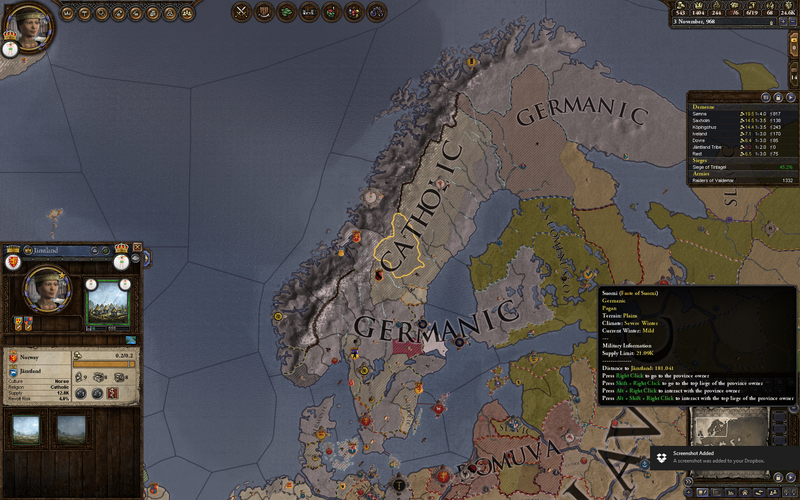 Fortunately the reformed Germanic faith has a holy order of its very own, the Jomsvikings. 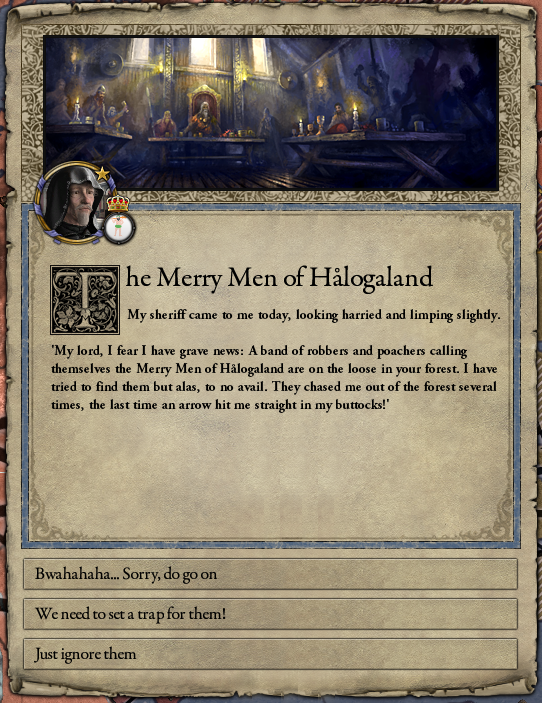 I bring them in, along with some mercenaries. 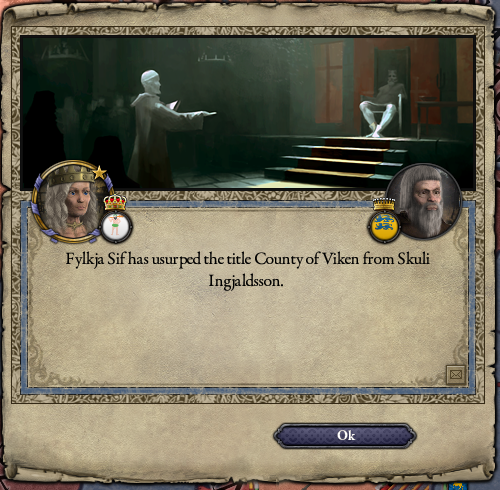 Only to discover Viken has brought in ANOTHER holy order! 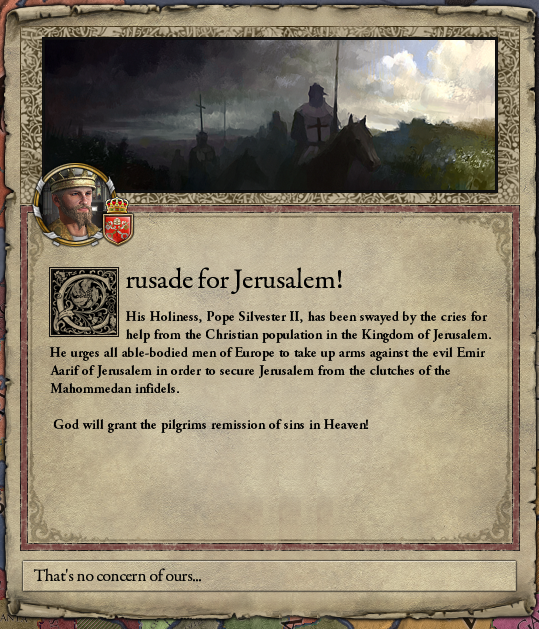 They must be pious as balls. 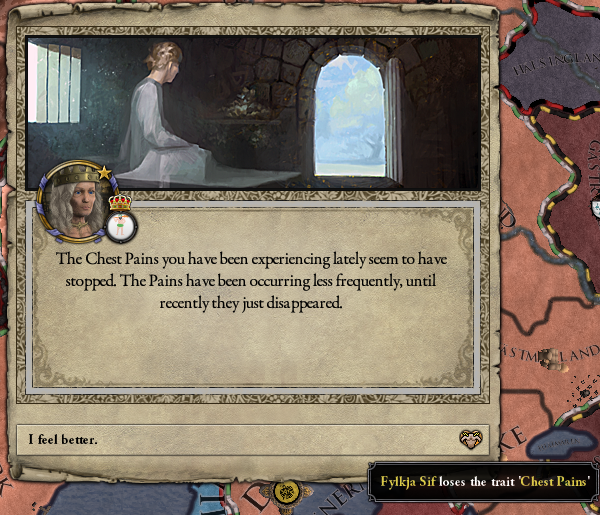 Fortunately a) they couldn’t afford to keep paying them indefinitely, and b) a lot of them froze to death trying to besiege my castles. So everything turned out all right in the end, though it cost more than I would have liked. 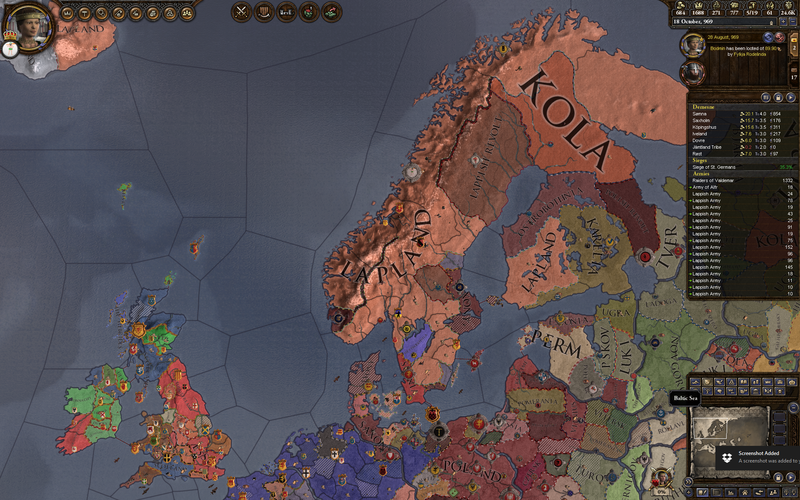 Next on the hit list is Kola, which controls a couple of counties on my eastern border as well as a random assortment of stuff throughout the insanely fractured east. 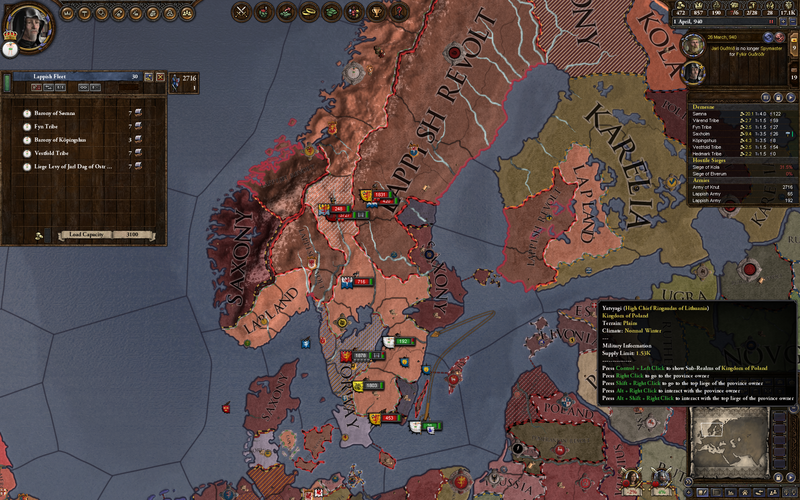 Unfortunately, their scattered territory makes for a very slow war, and I can’t get it wrapped up before another set of vassals comes calling, demanding gavelkind succession. Obviously we can’t have that, so I make peace with the Kolans and hurry back to deal with them. 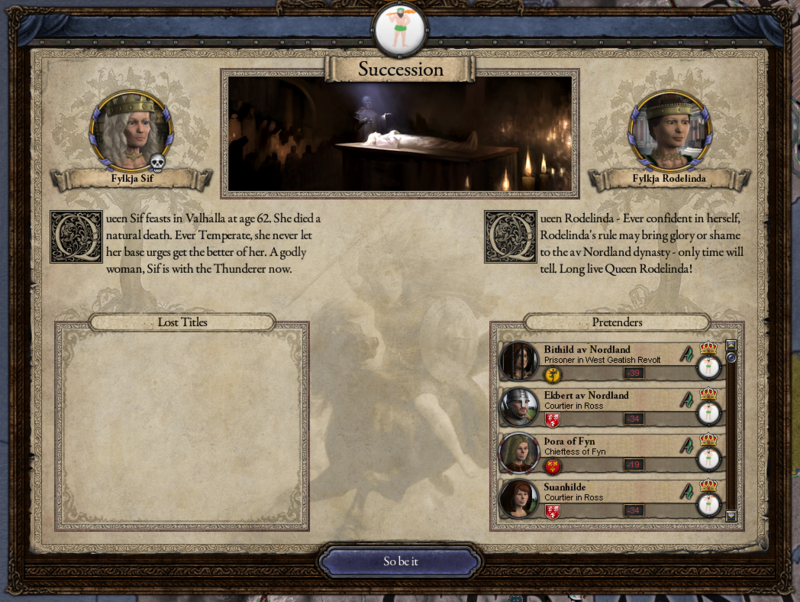 This time, the rebels aren’t particularly strong, and are easily crushed. Another set of vassals goes to jail, and now I can easily strip them of some titles. 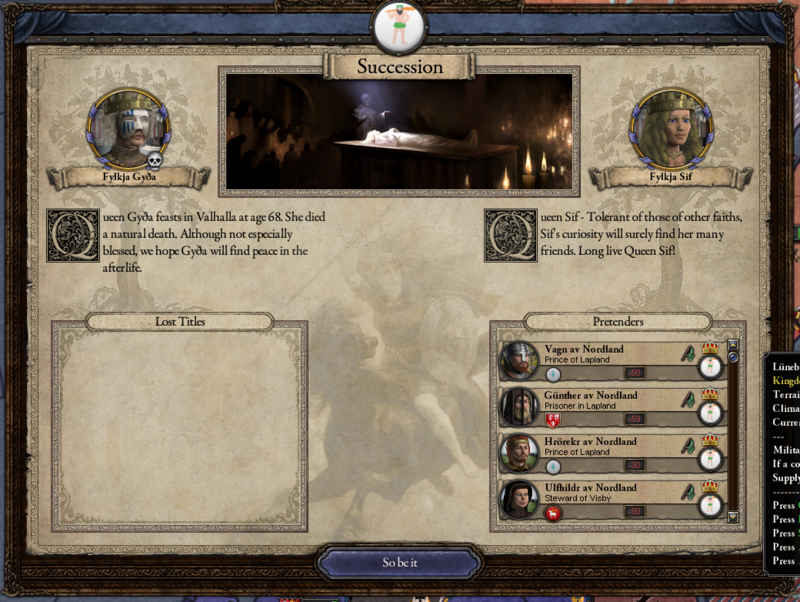 Sif dies soon after, having reigned longer than expected and done important work raising royal authority. The new queen, Rodelinda, jumps us back to the line of Gurli and Gloð, being the granddaughter of King Guðroðr’s younger brother. Are you keeping track of all this? There’s going to be a quiz. 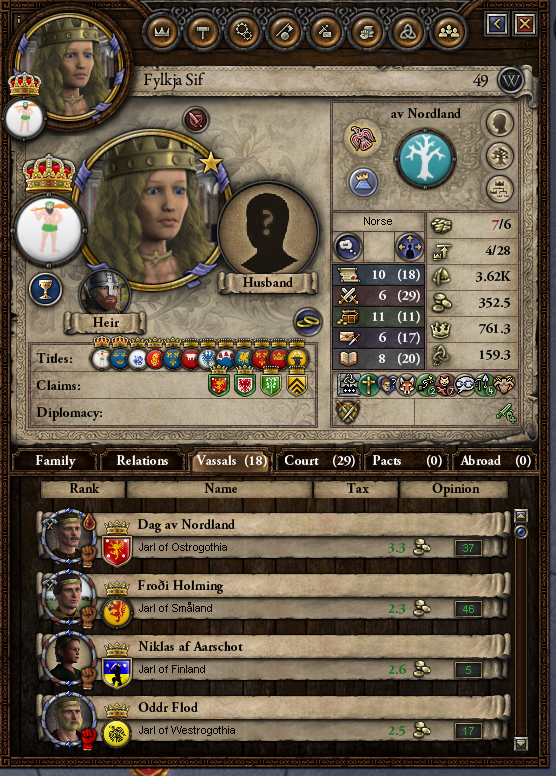 Like many of my recent monarchs, she is profoundly mediocre, but at least she’s only 33 and not yet ill. She is, however, Saxon rather than Norse, which is not ideal. 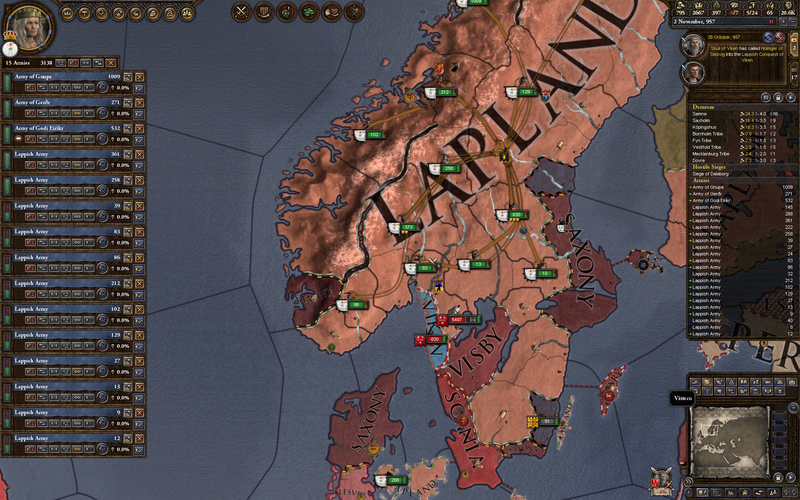 Lapland is still looking nibbled at the edges. Kola and Karelia are both still strong in the east, while Saxony and Austrasia (the gray blob in the midst of France) both have holdings. There’s a few independent realms too, though, that are better targets for expansion, particularly Westrogothia. Grr. 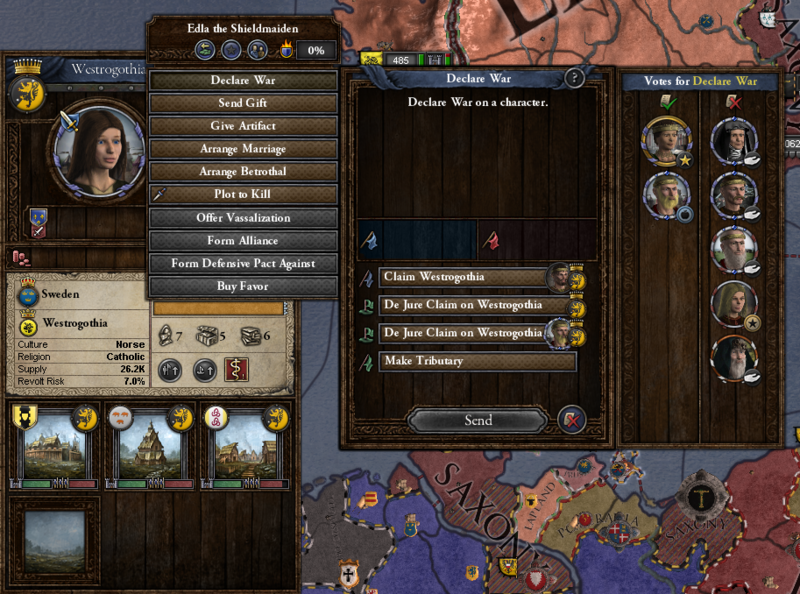 One jerk who has been handing out favors dominates my council, and they refuse to declare war on Westrogothia. That’s annoying. Temporarily thwarted, I work on upgrading my holdings. 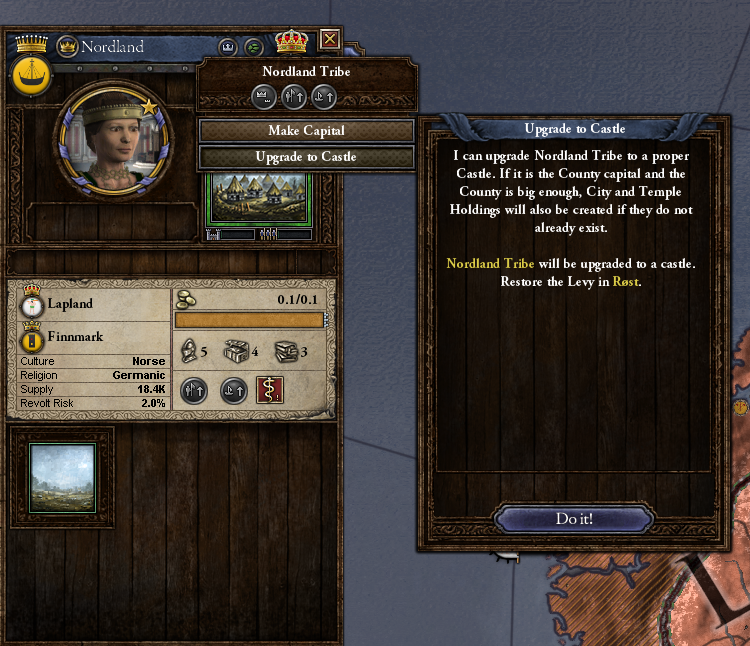 Tribal holdings that are sufficiently advanced and Germanic can be upgraded to feudal, which increases their tax revenues and levy contribution. 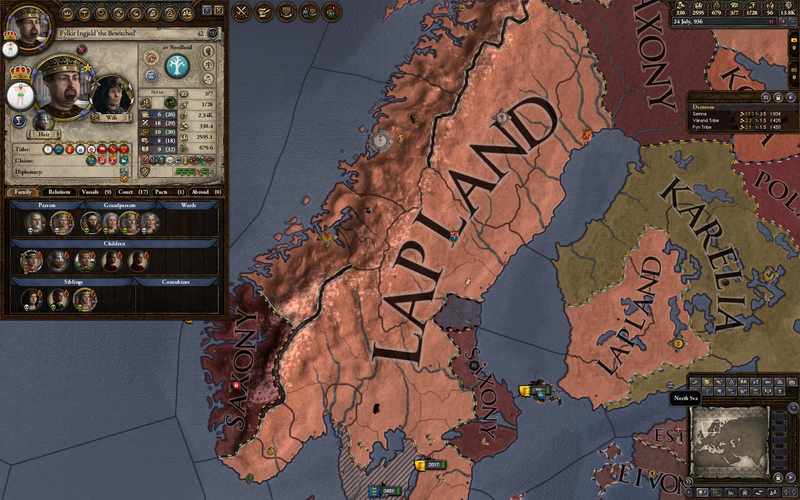 Slowly but surely, I’m dragging Scandinavia into the 10th century! 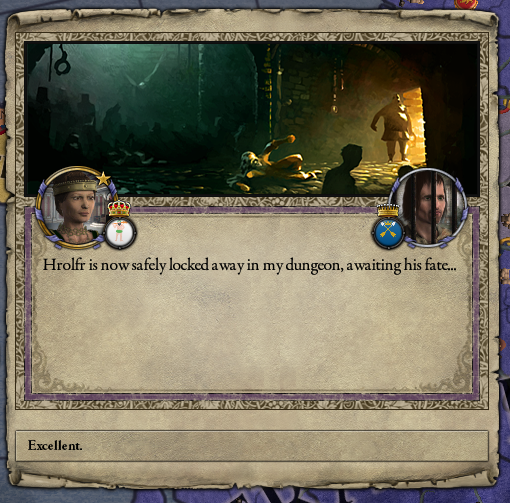 I also catch quite a few of my vassals plotting, and throw them in prison. 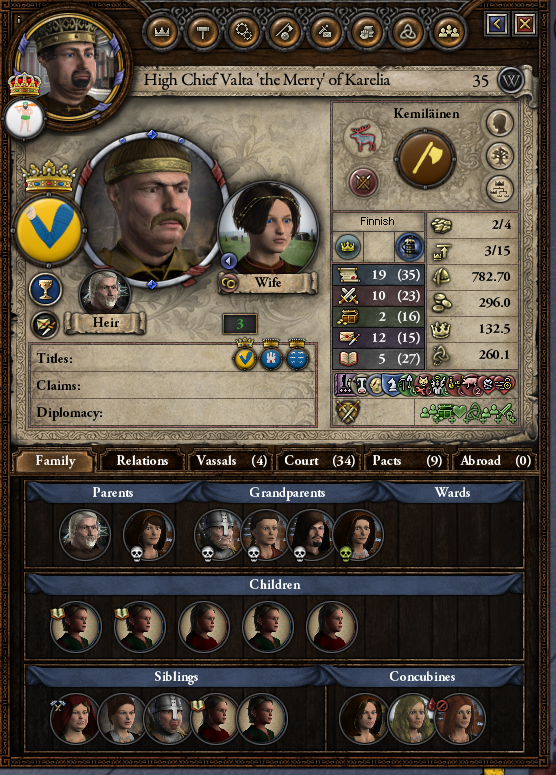 Unusually, I actually manage to catch most of them before they start a revolution. 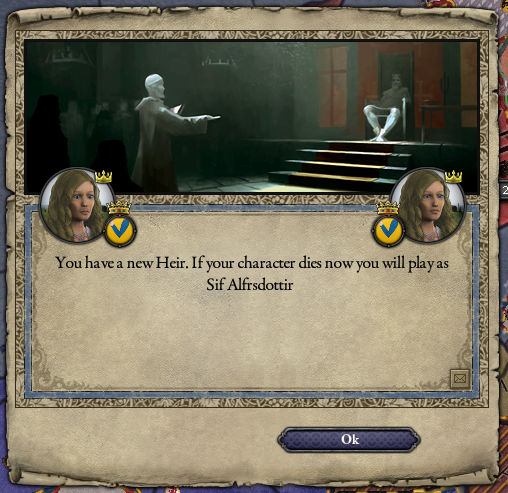 This is actually kind of annoying, since imprisoning someone without them revolting doesn’t give you the authority to revoke their titles. 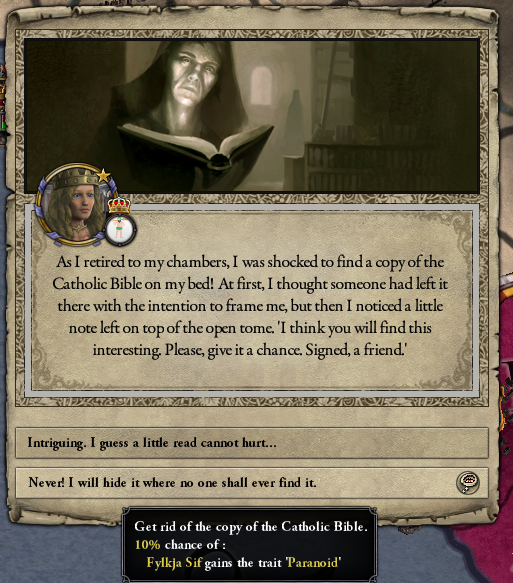 Also, an alarming number of my lords are becoming Catholics! 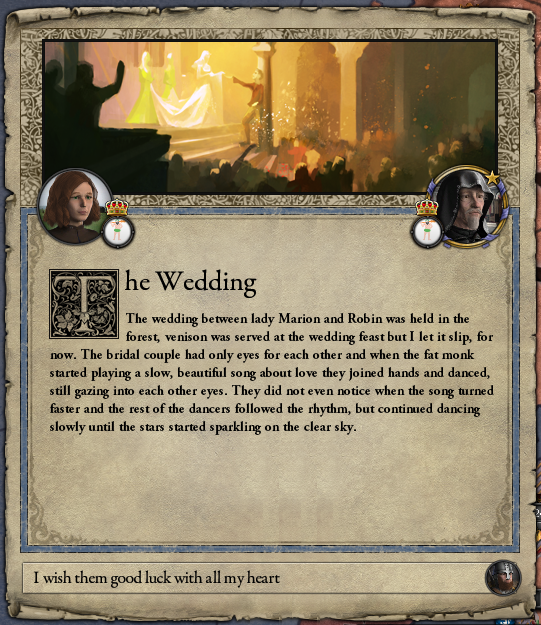 With most of my money spent on building bigger castles, it’s time for … well, you know the drill. Another day, another count in the dungeons. Good. Stay generally pointed in that direction, please. It’s always a blessing to have another viking in the family! 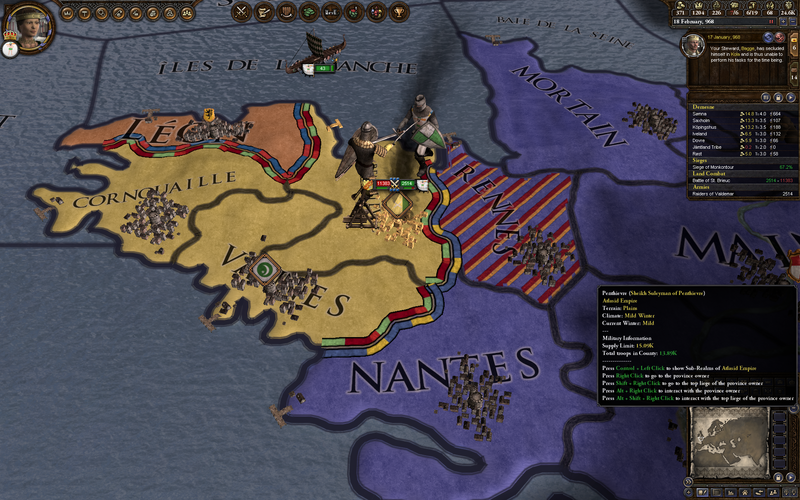 Burning down this Breton castle is taking a while, so I send the fleet back home to drop off the loot. This proves to be a serious mistake. 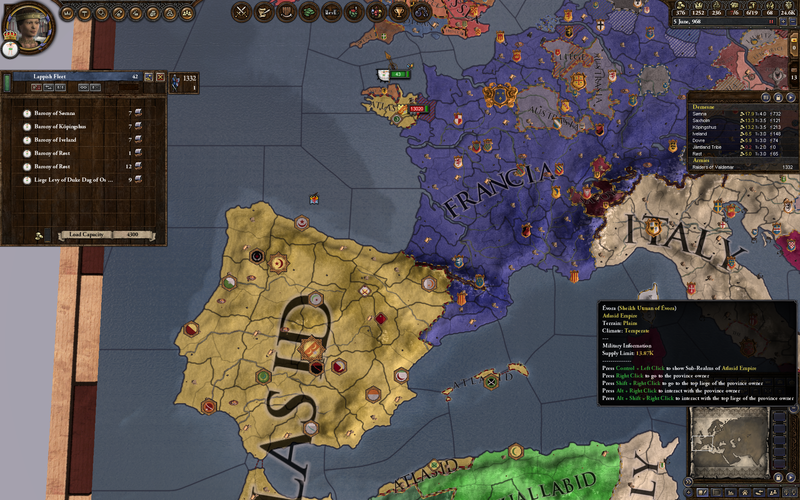 Brittany is now owned by the Atlasid Caliphate, which controls all of Spain and chooses this moment to send a huge army north to register their displeasure with my constant arson. My fleet returns just in time to evacuate the shattered survivors. We’re gonna go raid in Cornwall, where it’s a little safer. 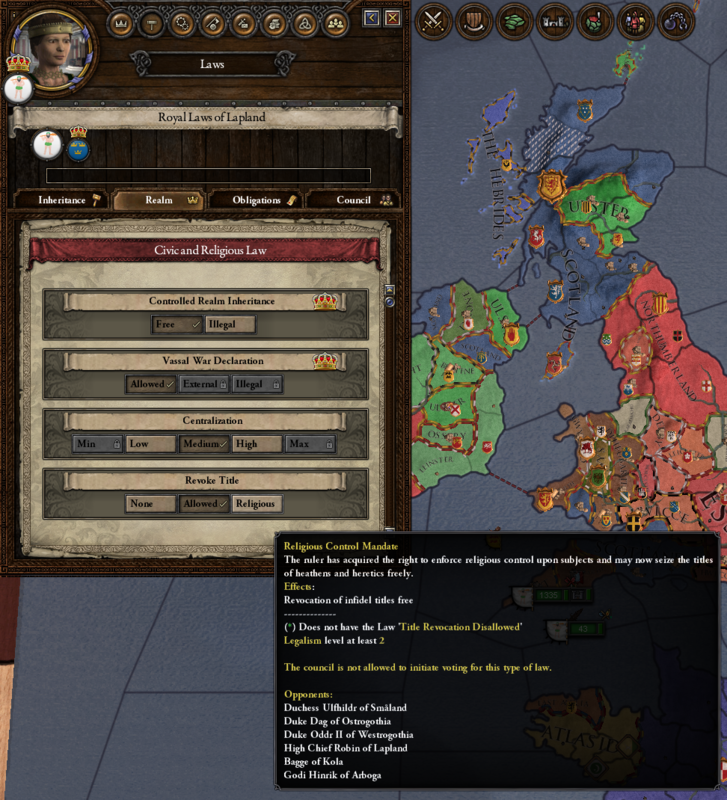 I’m trying to upgrade one of my counties to feudal, and I find out they’ve turned Catholic! There’s Catholics everywhere. This can’t be borne. 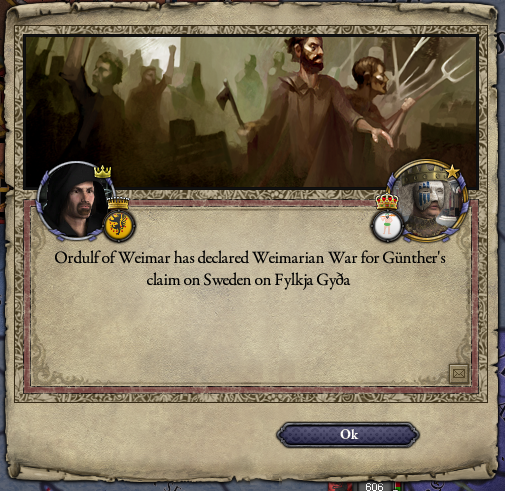 What I’d like is the authority to revoke titles from non-Germanic rulers at my whim, but my council of course is dead set against the idea. 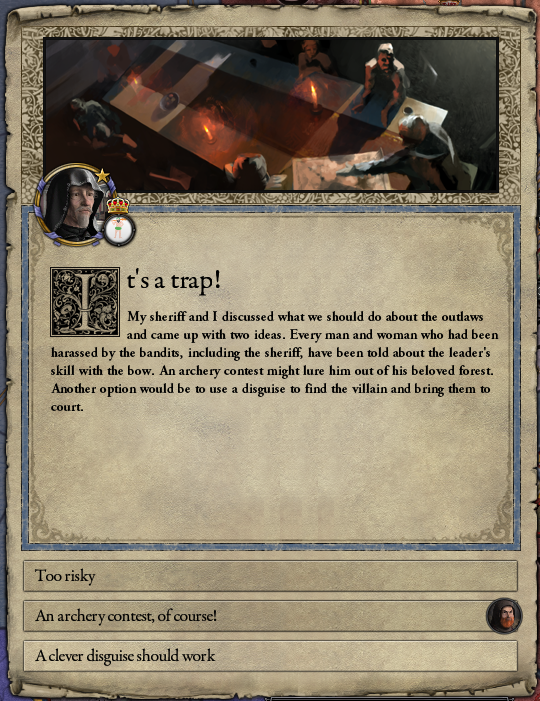 Stupid council. 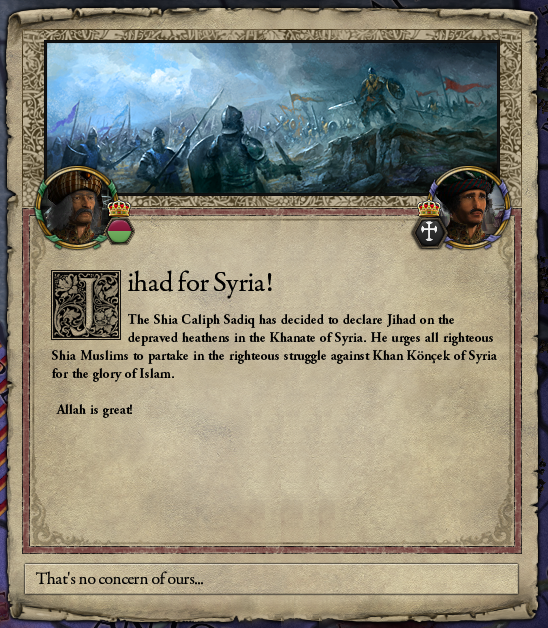 Current Year: 969 AD. Current Status: Thwarted.